Last week I attended the world premiere of Colonization Road at the imagineNATIVE Film & Media Arts Festival. Directed by Michelle St. John, the film follows Anishinaabe comedian and activist Ryan McMahon as he delves into the history of Indigenous dispossession and settler colonialism in Canada. Examining physical markers of this history such as Colonization Road in Fort Frances, Ontario, McMahon asks, “what do we mean when we talk about colonization?” Drawing on the experiences and expertise of a wide range of Indigenous and non-Indigenous scholars, activists, and community leaders, the film details the many facets of historical and ongoing colonization and the nature of settler colonialism as a structure. In this piece, I want to reflect on the ways in which I hope this film sparks further discussion among historians, educators, heritage organizations, and the wider public. The majority of early twentieth century material – tourist pamphlets, school curricula, and local histories – I analyse in my dissertation reflect the colonial narrative in microcosm. This story usually starts with French explorers and fur traders and eventually centres on hardy settlers making seemingly unoccupied land productive. Indigenous people are usually peripheral to this story or entirely absent from it. How they ended up on reserves remains a mystery. How much of this narrative has changed in the past hundred years? Source: The Education Committee, Simcoe County Council. The County of Simcoe: An Outline for Use in Schools, date undetermined. 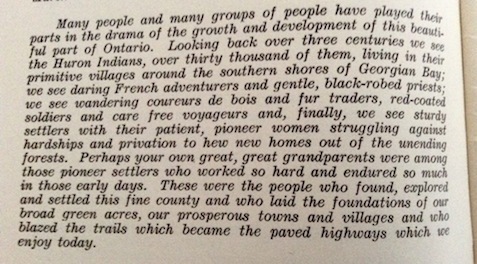 Part of my motivation in researching settler colonialism in southern Ontario stems from the frustration of reading histories of settlement that all too often completely overlook the other side of that equation – the necessary displacement and relocation of Indigenous peoples and communities. As Paige Raibmon asserts, “under settler colonialism the displacement of original inhabitants and the arrival of new ones are mutually reinforcing projects. Yet historians have long treated colonization and immigration – the twin histories of indigenous lands and settler lands – as separate topics.” Historians can contribute to changing this narrative by identifying and being explicit about settler colonialism as it intersects with our topics of study, whether those are focused on Indigenous histories or other subfields. One of the most effective ways we can challenge settler colonialism is to examine it within our local contexts, by asking questions such as ‘what are the Indigenous histories of this area, and how have they been overlooked or erased within local historical narratives?’ Initiatives such as First Story in Toronto, the Ogimaa Mikana Project in various locations across Ontario, Indigenous Walks in Ottawa, and the Amiskwaciy History Series in Edmonton are excellent examples of the ways in which non-Indigenous people can learn local histories from Indigenous perspectives. We can also critically examine the ways in which local Indigenous histories are presented on or absent from commemorative plaques and markers. Do our municipal and regional websites include history pages that include Indigenous perspectives? Often these are entirely missing or inaccurate. These stories that overlook Indigenous perspectives are not confined to textual material – they are often at the centre of interpretive displays in local museums and historic sites. I am not suggesting that we do away with narratives of settlement, but that we revisit them, recognizing that they are entwined with histories of dispossession, and centre Indigenous perspectives in critical retelling of these narratives. There are many ways museums can work together with Indigenous communities. One of the most powerful exhibits I visited earlier this year is Niitsitapiisini: Our Way of Life, a permanent exhibit formed in collaboration between the Glenbow Museum and Blackfoot communities. Local archives and libraries, as well, can play a central role in the retelling of these stories, by making concerted efforts to determine what Indigenous records and resources they hold, and in doing so, connecting with Indigenous communities. The latest issue of the Archives Association of Ontario’s Off the Record publication focuses on archives and Indigenous issues. These conversations are important as we approach the 150th anniversary of Confederation. As Thomas King reminds us in The Truth About Stories, “Once a story is told, it cannot be called back. Once told, it is loose in the world. So you have to be careful with the stories you tell. And you have to watch out for the stories that you are told.”  Colonization Road urges Canadians to critically engage with the stories we tell about the history of this country, and it is time for us to heed this message. Anne Janhunen is a Ph.D. candidate in the Department of History at the University of Saskatchewan. Her dissertation focuses on early twentieth century Anishinaabeg land use, labour, and collective political organizing within the context of settler colonialism in south-central Ontario. Batell Lowman, Emma and Adam J. Barker. Settler: Identity and Colonialism in 21st Century Canada. Winnipeg: Fernwood Publishing, 2015. Baldwin, Andrew, Laura Cameron, and Audrey Kobayashi. Rethinking the Great White North: Race, Nature, and the Historical Geographies of Whiteness in Canada. Vancouver: UBC Press, 2011. King, Thomas. The Inconvenient Indian: A Curious Account of Native People in North America. Minneapolis: University of Minnesota Press, 2013. Manuel, Arthur, and Grand Chief Ronald M. Derrickson. Unsettling Canada: A National Wake-up Call. Toronto: Between the Lines, 2015. Morgan, Cecilia. Creating Colonial Pasts: History, Memory, and Commemoration in Southern Ontario, 1860-1980. Toronto: University of Toronto Press, 2015. NYC Stands with Standing Rock Collective. “#StandingRockSyllabus.” https://nycstandswithstandingrock.wordpress.com/standingrocksyllabus/, 2016. Vowel, Chelsea. Indigenous Writes: A Guide to First Nations, Métis, and Inuit Issues in Canada. Winnipeg: Highwater Press, 2016. Paige Raibmon, “Unmaking Native Space: A Genealogy of Indian Policy, Settler Practice, and the Microtechniques of Dispossession” in Harmon, Alexandra, ed. The Power of Promises: Rethinking Indian Treaties in the Pacific Northwest (Seattle: University of Washington Press, 2008), p. 57. Thomas King, The Truth about Stories: A Native Narrative. Toronto: House of Anansi Press, 2003, p. 10.